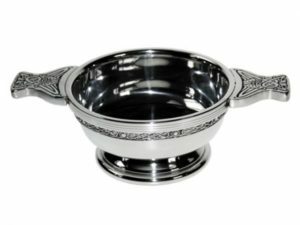 The quaich, Scotland’s cup of friendship, has been used through the centuries to offer a welcoming drink at Clan Gatherings, and other family occasions, and to friends and visitors. 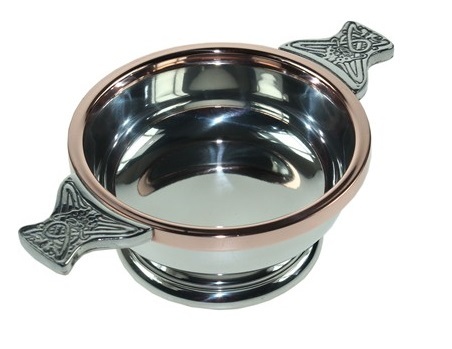 “Quaich” is a Scots rendering of the Gaelic word “cuach”, meaning cup. The two-handed design of this drinking vessel incorporates trust, on the part of both giver and receiver. Quaichs were used most commonly to contain whisky and brandy but larger quaichs were vessels used for drinking ale. 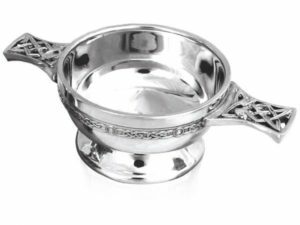 Unproven theories suggest that the quaich may have been based upon 17th Century bleeding vessels, or have evolved from the use of scallop shells as drinking vessels. Some quaichs’ bottoms are made of glass, allegedly so that the drinker could keep watch on his companions. 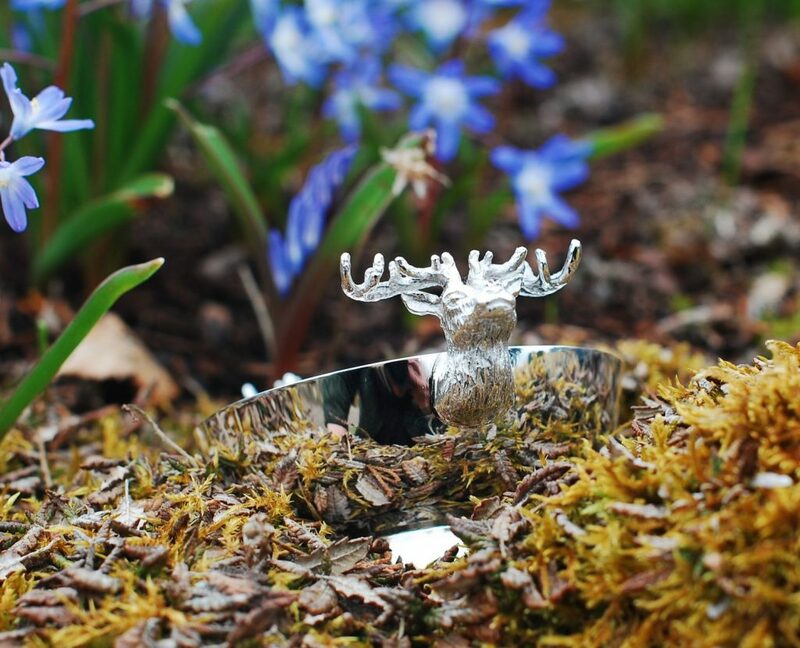 The romantics amongst us prefer the tale of the design of quaich which had a double glass bottom, containing a lock of the owner’s lover’s hair, so that he could always drink from his quaich to his lady love. In 1589, King James VI of Scotland gave Anne of Denmark a quaich as a wedding gift. Traditionally quaichs are made of wood, and some early quaichs were stave-built, like barrels. The staves were held together by bands of willow or silver, with two, or sometimes three or four, short projecting handles. Other wooden quaichs were made out of a single piece of wood, turned on a lathe. In addition to wood, quaichs were and are are made from stone, brass, pewter, horn, and silver. The origin of quaichs in Scotland seems to have been in the Highlands – quaichs did not become popular in the large cities of Edinburgh and Glasgow until the end of the 17th Century. The silversmiths of local guilds in Inverness and Perth frequently mounted quaichs in silver, as evidenced by the hallmarks on existing objects. 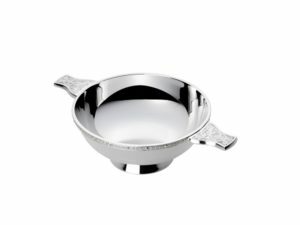 Silver quaichs were first mentioned in the 1660s, and the making of quaichs was a highly regarded profession in 17th Century Scotland. Silver quaichs were thinner and more delicate, allowing fine Scottish ladies to drink from them more easily. So the wooden stave quaichs of centuries past evolved into silver mounted, and entirely silver, versions, and Sir Walter Scott and Bonnie Prince Charlie have been amongst their illustrious owners. In the 19th Century, Sir Walter Scott is said to have dispensed drams in silver quaichs. One of the quaichs he owned was known as the Waterloo Tree Quaich. It was made in part from wood Scott had taken from the Waterloo Elm – the Duke of Wellington’s command post – when Scott visited the battlefield, shortly after the Battle of Waterloo. Scott is known to have also owned some other quaichs made from commemorative wood: one made from Falkland Oak; one made from Queen Mary’s yew; and another made from the Wallace Oak. One was particularly precious to him, as in 1745 that quaich had travelled from Edinburgh to Derby with Bonnie Prince Charlie. 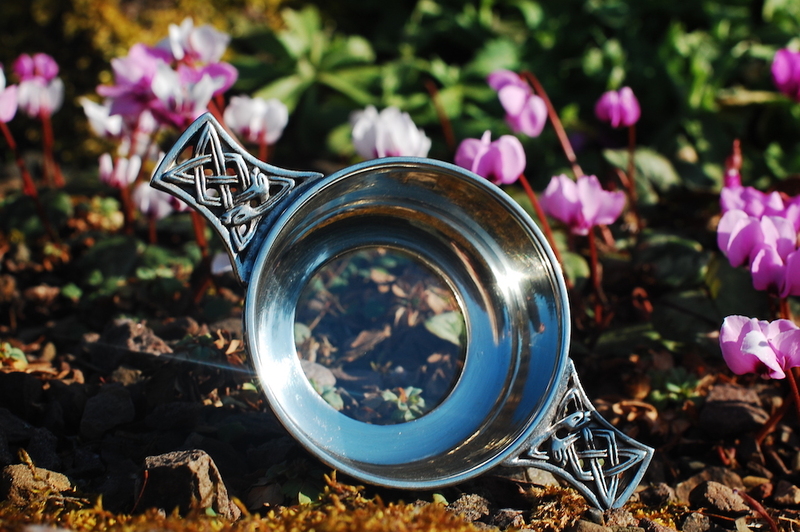 The quaich’s simple, yet beautiful, form has ensured its longevity as a vessel offering kinship and love, from the humble Highland crofter, through proud Clan Chiefs to the Kings of Scotland. 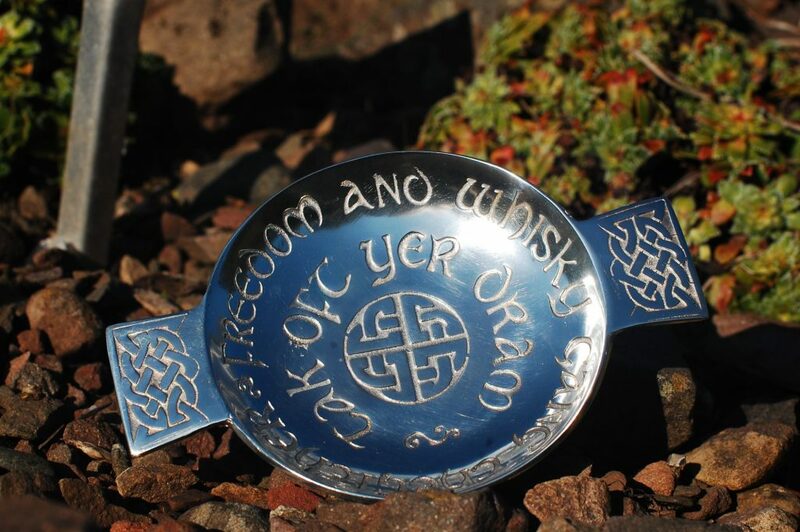 The quaich’s unique history is shrouded in myth and mystery, and such vessels are often amongst the most treasured possessions of those with family links, or other associations, with Scotland. More recently, quaichs have been used as favours at many Scottish weddings, being presented to everyone at the top table. Quaichs have also been used at births, to drink to the baby’s health and celebrate the new life, and at christenings. 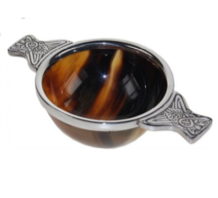 In Kilmuir in Scotland, there is a wooden quaich which was formerly used as a baptismal font – quaichs have now also become a traditional baptismal gift. Commemorative quaichs awarded as prizes, or given as gifts, are more commonly made of pewter or silver – these prize cups are rarely used for actual drinking. 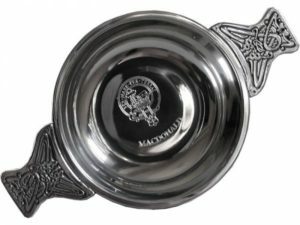 Present day use of the quaich as a gift or trophy carries with it and preserves this link with Scotland’s proud and ancient heritage. 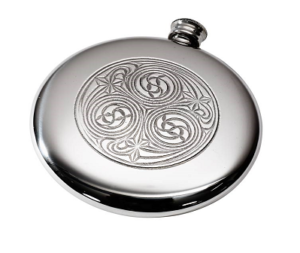 Engraving can personalise, or record for posterity, virtually any special occasion or event.